Miles Prower　(Japanese: マイルス・パウアー), also known by his nickname, "Tails" (Japanese: テイルス), is a two-tailed fox who is a recurring character in the Sonic the Hedgehog series of video games and related media. Since his introduction in 1992's Sonic the Hedgehog 2, he has become one of the most popular of the Sonic characters, and a staple in the series. Line art of Miles "Tails" Prower taken from Sonic Jam. After the success of the original Sonic the Hedgehog, Sega was insistent that a sequel be made to capitalize on the Sonic name. After some internal drama, portions of Sonic Team traveled to work with Sega of America's Sega Technical Institute to create the numbered follow-up. One element they wanted to introduce was a new character that would not just be a companion to Sonic and fulfill the classic sidekick role, but also be playable and draw attention, and hopefully new players, to the franchise. An internal competition was held at STI, and while numerous designs were once again submitted to be considered for the role (including a rocket-powered turtle named Boomer), it was Yasushi Yamaguchi who would win out with his design. Yasushi had created a two-tailed orange fox whom he affectionately called "Miles Prower," the name intended to be a pun on the phrase "Miles per Hour," a clever homage to the Sonic the Hedgehog character and franchise, which pushed the speed aspects in advertising and the like. However, the Sonic 2 team wanted to go with a much simpler name, "Tails," which Yasushi was none too pleased with. Sneaking his original name onto the concept art, it was decided that a compromise would be reached, with Miles being the character's real name and Tails being the nickname. With the concept in place, Tails was soon programmed into the game with its patented system, and he became part of one of the most successful games in the Sonic the Hedgehog franchise. The classic Tails design, as used from 1992-1997. Just like Sonic the Hedgehog's past, nothing explicit is mentioned of Miles "Tails" Prower's home and history. While according to the Game Gear title Tails Adventures it is said he once lived on Cocoa Island before he met Sonic, by the time Sonic the Hedgehog 2 is about to take place Tails has taken up residence on West Side Island. While living there, Tails is the subject of much teasing because of his namesake - the two tails that make him quite different from everyone else. However, everything changes for the young fox when he spots a blue streak on the island. Intrigued, he begins to follow what he would discover to be Sonic the Hedgehog. Watching him, he decided that he wanted to be just as cool as his now-hero, even if Sonic (at first) pays no attention to his constant companion. While eventually Sonic puts up with Tails' constant trailing, and even admires the fact that he is able to catch up to Sonic's own speed from time to time, he doesn't think much of it, and never sticks around all that long for Tails to get to know him. One day, while Miles Prower is exploring the beach, he comes across an antique bi-plane, and becomes immediately attached to it, and is only more excited when he sees who is napping under it - Sonic. Before he can let this sink in, Sonic is awaken by an explosion in the forest - a pillar of fire caused by none other than Dr. Eggman, who has followed Sonic in the hopes he would lead him straight to the Chaos Emeralds. Sonic immediately runs after his adversary, and Tails quickly follows. Over the course of this adventure, their bond grows stronger, with Tails helping out Sonic when he needs it. By the time they reach the Death Egg, Sonic has grown to not only respect Miles, but to consider him a friend, and their relationship in future games reflecting an older/younger brother relationship rather than the tag-along nuisance that Sonic originally thought of him as. Miles "Tails" Prower's profile from Sonic Jam. The original unveiling of Tails' redesign. From Sonic Adventure. Miles "Tails" Prower is an 8 year old orange fox whose most recognizable trait is his twin tails. While he was originally teased for them, he has learned to appreciate and love his tails, especially since they have come in handy once joining Sonic the Hedgehog in defeating Dr. Eggman's plans time and time again. Being able to twirl his tails together, Tails is able to lift off the ground and use them as a helicopter, and fly for short periods of time. He can also use them while on the ground, giving him an extra burst of speed to catch up to Sonic while running. Tails can even use them to attack enemies, able to break robots in Sonic 3 & Knuckles by flying up into them horizontally, and uses his tails as a whip in Sonic Adventure to break enemies on the ground, called the "Tail Rotation Attack." Tails is sweet-natured and humble, not one to grab the spotlight for himself, instead ready to help out his friend and idol Sonic whenever necessary. While he isn't the bravest, he has become more outgoing since he has met Sonic, becoming the hero when need be. Regardless, Tails hopes to one day be self-sufficient, and not constantly rely on others, and be just as independent as Sonic. However, he feels most at home inside his workshop in the Mystic Ruins, working on his various mechanical creations and tinkering with items that might help them when they next face Eggman. In fact, it is said that Tails' mechanical prowess might match that of Eggman or even surpass it, but he has yet to reach his full potential when it comes to that field. But even through all his trials, Tails can still be frightened by the sound of thunder. Tails also has a strong affection for mint candy. Tails does share some of Sonic's well known moves, such as the spin attack and the spin dash. He also has the ability to swim, something that Sonic has yet to learn. Tails can also carry Sonic for a bit while he's flying, but until Sonic 4 Episode II was unable to replicate this assistance underwater. Unlike his peers, Tails can not as easily transform into a super-powered form, only able to achieve the status of Super Tails with the power of the Super Emeralds. Even then, he still needs help, a group of four flickies showing up to share in the power, assisting in attacking enemies that may be about. While not as proliferate as Dr. Eggman,Tails has been known to create more than a few mechanical items of his own which have proven useful over the years. The first of these was made before Tails had ever met Sonic the Hedgehog. The Sea Tail, an underwater vehicle, was created during Tails' time on Cocoa Island, was used during his run-in with the Battle Kukku army. It also had the ability to transform into a "Mecha Tails" form, which could do reconnaissance work in places Tails couldn't reach. Tails using the Cyclone from Sonic Adventure 2. Perhaps his most recognizable work has been on the Tornado series of bi-planes. 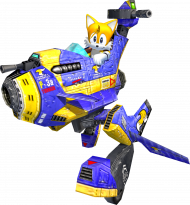 While he did not build the original, Tails did do some modifications to it after it was damaged in the chase to Eggman's Wing Fortress in Sonic 2. This model served as the inspiration for Tails' own version, the Tornado 2, which was powered by Chaos Emerald energy and had the ability to transform into an attack mode. This was followed up by the Tornado III, also known as the Cyclone, which was used in Sonic Adventure 2. Unlike the previous model, it could be flown and used as a mech without the aid of a Chaos Emerald. Tails has also made some other items of note, such as the Jewel Reader, a machine used before the events of Sonic 3 to track down Chaos Emerald energy. The fox also had a similar tool, the Miles Electric, to help him and Sonic get around the broken planet in Sonic Unleashed, not looking for Chaos Emeralds but to track down the ancient shrines to help restore their power. The Miles Electric is used in Sonic Colors to decode what Yacker says. He was also able to create a false Chaos Emerald, possessing nearly the same properties as an original, which was designed to stop Eggman's plans in Sonic Adventure 2. Tails' mechanical expertise was once again put to use in Sonic the Fighters, where he built the Lunar Fox to quickly get to the Death Egg II, the spaceship and its speed possible by the power of the Chaos Emeralds. He was also responsible for the presence of Mecha Sonic No. 23, used as a reconnaissance robot that could transform between the classic Metal Sonic look and a rocket. While this was used to help Sonic and company discover the existence of the Death Egg II, it is unknown if Tails built the machine from scratch or used a model discarded by Eggman. As is the case with Sonic the Hedgehog, Miles "Tails" Prower's storyline has been modified to fit in with other media. When Sonic the Hedgehog 2 was being localized for Western markets, they decided to simplify Tails' origin. Instead of being teased for his two tails, Tails is instead praised by the animals on the island, and love him for his namesake. He is also obsessed with Sonic for far longer, trying to emulate his hero as he grows up. In one instance, trying to emulate the sonic spin, Tails inadvertently creates the spin dash, echoing the western notion that the animals on South Island had taught Sonic everything he knows. Sometime after, Dr. Robotnik strikes once again, and Tails, somehow escaping the badnik process, decides to follow Sonic around as he sets off to stop the doctor and his Death Egg. In the Saturday morning series Sonic the Hedgehog, Miles Prower is treated as just another survivor of Dr. Robotnik's takeover of the planet Mobius. While he and Sonic do have a bond and act as brothers, they do not have the same sort of friendship they do in the games. More often than not, Tails is left behind at Knothole Village while the rest of the Freedom Fighters go to Robotropolis, citing Tails' age as a reason. Being significantly younger than the rest, Sonic and company act more protective of their younger friend. While he does eventually become a full member of the team, a relationship between Sonic and Tails closer to the games never got a chance to materialize, due to the cancellation of the series. Turbo Tails is trapped as Sonic and Tails' doppelganger look on. The comic book version of Miles Prower in the series Sonic the Hedgehog attempted to find a balance between the protected version of Tails from the Saturday morning series and the more carefree version from the syndicated series. While he was still treated as being younger and warned of the dangers of Robotropolis, Tails would often be a part of the various raids and adventures the team would have. Born to Amadeus and Rosemary Prower, Tails was unable to even know his parents as his birth happened just prior to the takeover of Mobotropolis by Dr. Robotnik. Raised in Knothole, Tails gravitated towards Sonic, and the two were able to share a relationship that more closely resembled the games. The mother figure of the young fox took the form of Princess Sally, whom he would call "Aunt Sally." While these ties would sometimes be strained because of the soap opera-esque tales spun by Ken Penders, they would always be resolved in time for the young fox to help save the day from Robotnik or whatever force threatened the planet. Tails was eventually reunited with his parents when it was discovered that they had not been lost during the coup, but rescued by an alien race known as the Bem. Living off planet during the interim, it was only during the invasion of the Xorda that Tails was able to discover his parents were actually alive and well. Unlike his game counterpart, Tails has the ability to transform into a super-powered form using only the Chaos Emeralds, known as Turbo Tails. 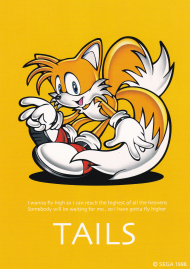 Tails also has another form, as stated by his role in "The Chosen One" prophecy. Over the entire Cosmic Interstate, Tails is the only one who can call upon all of his various versions of himself and transform into "Titan Tails," who was the only one able to defeat Mammoth Mogul when it looked as though the multiverse was doomed. Before he was able to fulfill this prophecy, Tails was briefly kidnapped by Mogul, who then created a doppelganger Tails, who fought alongside the Freedom Fighters from issue 94 to issue 114. Even the double was unaware of his falsity until 114, when he fought against Mogul to free the real Tails. While Tails is now eleven years old in the series, it hasn't stopped the writing staff from hinting at possible relationships for the fox. The first time this happened was in the prelude to his Archie miniseries, in which he fell for Fiona Fox, who turned out to be a robot created by Dr. Robotnik. Later on, Tails discovered that the robot had been based on a real fox, albeit much older than the robot model suggested. Sonic briefly went out with Fiona, causing a riff between the two, but they reconciled when Sonic revealed he did it simply so Tails could get over his crush. Also, while he enjoys spending time with Mina Mongoose in the main series, Mina is shown to be his wife in the possible-future storyline "Mobius: 25 Years Later." The DiC-produced syndicated series Adventures of Sonic the Hedgehog portrayed Tails closer to his game counterpart than the other series at the time, Sonic the Hedgehog. Having been an orphan with no knowledge of his family, Tails was found by Sonic one day by falling on his head, being thrown out of a birds nest. Tails explained to Sonic that he thought he was a bird, because of his ability to fly, and Sonic decided to take the young fox with him, and help raise him as well as be a friend. Through the course of the series, it is rare to see Sonic and Tails separated, even though the fox is quite younger than the blue hedgehog, and often gets into trouble with Robotnik and his plans. This version of Tails is also quite disdainful of his true name, Miles Prower, unknowingly echoing the sentiments of the original Sonic the Hedgehog 2 production team that wanted to change his name. 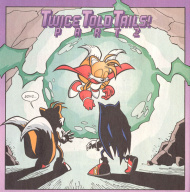 Miles "Tails" Prower featured on the cover of Sonic the Comic issue 29. While Tails first met Sonic in the Emerald Hill Zone of Sonic the Comic, the two-tailed fox did not actually originate from Mobius at all. Having gone through a space warp to Mobius, the young fox arrived on the other side in the mistaken belief that the Emerald Hill Zone was actually lined with real emeralds. While he was quick to discover his folly, he decided to stay on Mobius when he encountered Sonic the Hedgehog, and decided to become his sidekick. While they would often work together, and were friends, Tails was often on the end of many of Sonic's jokes, and was far from the buddy-buddy portrayal of the DiC-produced series or even their relationship in Sonic Adventure. During the course of the comic's lifespan, Tails grew beyond just another fodder character that could be kidnapped and became a hero in his own right. This was expanded upon in the stories depicting Tails returning to his home zone, the Nameless Zone, where he was celebrated as a hero from the misleading letters he wrote back home. Depicting himself as the central leader of Mobius and not Sonic, the people of his zone would ask him to help them against numerous enemies that threatened them. While he would later try to correct them, Tails was never successful, and had to defend the zone time and again in an enchanted suit of armor, sword in hand. Because of his early days as being kidnapping fodder, Tails would sometimes remark that many people underestimated his abilities, and could do far more damage than what some thought initially. Produced under the supervision of Sonic Team, the OVA Sonic the Hedgehog presented Tails close to his video game counterpart. He was a genius when it came to electronics, and was a close friend of Sonic. However, their relationship would sometimes boarder on the depiction presented in Sonic the Comic, where the hedgehog would get sick of Tails and his attempts to get Sonic's attention. Tails also was missing his ability to swim, which Eggman tried to exploit but failed to do so. Also produced under the supervision of Sonic Team, Sonic X once again stuck close to the original portrayal of Tails. In the series, however, Tails is drawn not to the original Tornado, but the Tornado 2, which he quickly makes his own after Sonic and Tails become friends. Once he is transported to the planet Earth, and meets up with Sonic once more, Tails becomes friends with Chuck Thorndyke, a fellow scientist whom Tails shares his passion in science. Together they work on the Tornado-X, which takes the place of the Tornado 2 in the Sonic Adventure adaptation. It must also be noted that many of the roles that Tails would have otherwise filled were replaced by Chris Thorndyke, Chuck's grandson, being the sidekick-in-distress through most of the series. In the final season of Sonic X, Tails' role becomes far more significant. He aids and befriends a Seedrian girl by the name of Cosmo and begins to form a romantic relationship with her. Tails also builds the Blue Typhoon, a massive aircraft capable of traveling through space. In episode 77, Tails' is forced to shoot Cosmo while she is immobilizing Dark Oak and the Metarex. Tails becomes distraught over the thought and even smashes his head against the control panel of the Sonic Driver. She eventually convinces him to do it and save the galaxy. Afterward, Sonic brings back Cosmo's seed and gives it to Tails. He eventually plants it in a flower pot in the last episode. While Tails was designed for the 16-bit version of Sonic the Hedgehog 2, the developers of its Master System/Game Gear counterpart decided to also use the character, albeit as a plot point only. Even though he was reduced to a kidnap victim, the game was released a month prior the Mega Drive version, making this Tails' first appearance. Although the other main cast members of the Sonic games have had issues involving their ages, Tails has always remained 8 - in the games. However, his age has fluctuated in Western media. In Adventures of Sonic the Hedgehog, Tails is only 4 and a half years old, yet does the same stunts he does in the games. In the original Saturday morning series, he is portrayed as being 10, yet is forbidden to go on many of the Freedom Fighters missions, even though he is older than his game counterpart. The Sonic the Hedgehog Technical Documents also quote his age as "about 10". Tails’ design takes cues from the ancient Japanese myth of the Kitsune, a mythical creature who resembles a fox but possesses up to nine tails depending on their age. Electronic Gaming Magazine named Miles "Tails" Prower "Best New Character" in its 1992 video game awards special. It in theorized that the Pokemon Buizel is based on the design of Miles "Tails" Prower. While the Pocket Monster is based on an otter, its color and forked tail design is highly reminiscent of Tails, especially since the Pokemon can use its tail to fly, spinning it in the same way and style Tails does. In the Sonic Internet community, there was a period when many people believed that Tails was originally meant to be the guardian of the Master Emerald in Sonic the Hedgehog 2, similar to the role Knuckles the Echidna plays in Sonic the Hedgehog 3, based on the removed Sonic 2 level Hidden Palace Zone. While Yuji Naka has said in interviews he wanted the Hidden Palace Zone to be the place where Sonic would be transported to once he got all seven Chaos Emeralds to become Super Sonic, he made no mention of Tails playing any other role. While there is a Master Emerald-like object in the level, level artist Craig Stitt revealed the emerald was meant to be nothing more than an obstacle that Sonic was to break through in the level. Most people have since dropped this theory. See Games featuring Miles "Tails" Prower. Please see Books Featuring Sonic the Hedgehog. Miles "Tails" Prower is featured in nearly every book on the list, with the exception of Michael Teitelbaum's novel Sonic the Hedgehog.